[162 Pages Report] The global Multichannel Marketing Automation Software Market size was USD 3.65 billion in 2014 and is projected to reach USD 5.5 billion in 2019, growing at a Compound Annual Growth Rate (CAGR) of 8.55% during the forecast period.Marketing Automation Software is a marketing tool that automates marketing process digitally by generating new lead and retaining them. The software offers complex process in order to have longer term lead nurturing through multiple online channels. The rising need of managing leads, segmenting premium customers from other, and converting customers into the premium one have given rise for need of marketing automation solutions. From SMBs to enterprises, the organizations are experiencing need of this software to target right prospects and customers with the right message. The major factor for the growth of Marketing Automation Software market is increasing demand for predictive analytics and community marketing. It helps the enterprises to gain customer insights, and make strategic decisions about their businesses by predicting the market demand and trends. It also provides customer visualization, with consistent, automatic, auditable, and high-quality communication through marketing processes. But the availability of open-sourced marketing automation software is acting barrier for the growth of the market. In this report, Marketing Automation Software market is segmented by application such as campaign management, e-mail marketing, mobile application, inbound marketing, lead nurturing and lead scoring, reporting and analytics, social media marketing, and other applications. The market is also segmented by deployment models and users. Under deployment model, it is segmented into on-premise and cloud-based solutions. By users, it is segmented as small and medium businesses and enterprises. The lead nurturing and lead scoring application have huge demand and thus it held the largest market share in the global market. Additionally, market has also been segmented on the basis of End-Users (Small Medium Enterprises and Enterprises) and Deployment Model (On-Premise and Cloud). The report also gives the detailed analysis of trends and forecasts, competitive landscape, key drivers, restraints and opportunities and analysis to the mergers and acquisitions related to the global Marketing Automation Software market. Major providers in this market are OracleEloqua, SAS, Adobe Systems, Act-On Software, Teradata Aprimo, IBM Silverpop, Cognizant, Marketo, HubSpot, and Salesforce. Marketing Automation defines, schedules, segments and tracks the marketing campaign with an automated workflow process. The software helps the marketers by reducing the monotonous task in customer segmentation and campaign management. The companies are continuously using and deploying cloud-based marketing automation software to carry out marketing and sales activities as the cloud computing technology offers more flexibility, greater space, and scalability for data storage. Marketing Automation software automates repetitive business task, develop and implement email marketing campaign, maintain track of current and potential customers, and it is useful in small industries too. Due to these features the solution is adopted widely across various sectors and thus the global Marketing Automation Software market is growing at the faster rate with the CAGR of 8.55% from 2014 to 2019. Furthermore, Marketing Automation Software market has seen significant growth during coming year as the need for the digital marketing has increased. The need for the predictive analysis and content analytics has boosted the market. The market landscape is shaped by the factors like mergers and acquisition by the key players, growth in third-party application ecosystems, enhancing the platform beyond e-mails. With the companies more focusing on SMBs with limited resources has contributed to the growth of the market. The marketing automation software offers applications such as Campaign Management, E-mail Marketing, Mobile Application, Inbound Marketing, Lead Nurturing and Lead Scoring, Reporting and Analytics, Social Media Marketing, and Other applications. The advancement in the marketing automation software has made available these applications on cloud and on-premise in the various verticals such as BFSI, Academic and Education, Retail, Advertising and Design, Health care, High Tech, Manufacturing and Distribution, Media and Entertainment and other verticals. 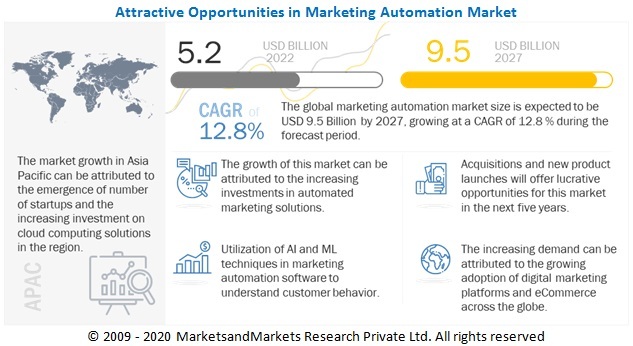 MarketsandMarkets expects the global Marketing Automation Software Market to grow from $3.65 billion in 2014 to $5.5 billion in 2019, at a CAGR of 8.55% during the forecast period 2014 - 2019. *Details On Overview, Products & Services, Key Insights, Recent Developments, Swot Analysis, Mnm View Might Not Be Captured In Case Of Unlisted Companies.